I'm here because a google search relating to propane heaters brought me here... and many of the subjects here interest me. I have a cabin in upstate NY. I grew up there, my family had a cabin there from before I was born until I was 14 or so. I kept in touch and visited occasionally, and (like many people there) returned 30 years later. 5 years in a small cabin not far from my parent's old cabin, then we moved into a larger cabin that was horribly decrepit. Fortunately the primary structure, like the other 60 or so cabins in the area, was built of native American chestnut that was being cleared out due to the blight of the 1920s and 30s, which is rot resistant... it was the interior work and additions that suffered years of neglect and unskilled repairs... cheap paneling, rodent infestations, tacky "improvements". I had to completely gut the interior, replace the kitchen floor and roof, and I built an addition to expand the master bedroom. 5 years of rebuilding that brings me to today. It's kind of a weird co-op arrangement, with a camp organization, strong on tradition, that controls the area and mantains a few common buildings. Probably 80% of the surrounding cabins are owned by kids I grew up with... half of them never left, taking over their parent's places, and the other half, like me, came back years later, proving that sometimes you can go home again. 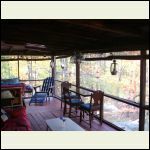 Most of the others only use their cabins during the summer and the occasional weekend in the spring and fall, only a few diehards like me use it year around... quiet and peaceful. It's on the grid, sometimes, electric and water (water for the entire area gets shut off for the winter, though, and the electric is notoriously unreliable, it was out for 8 months after Sandy), composting toilet in the cabin for the wife and a shared outhouse out back... propane stove and hot water, 1970s vintage wood stove in the living room and a 1920s era coal stove in the master bedroom. I love the canoe in front of the cabin. It totally makes that picture! Great place! I found this site while searching for information for our own cabin we are looking to put up on our newly purchased 10.6 acres. I can't believe I found a site that everyone talks about the same thing as I want to talk about. Really. You can go out and see various people and start talking about your building plans and not very many people can relate. My husband and I live a very simple life as it is. We have no furnace, but a wood stove. No dryer, but a nice big Amish clothes drying rack. We homeschool our three boys instead of sending them to school to practice for common core testing all year. We are both self employed after having vile and hostile work environments. We want an even simpiler place to escape to with no neighbors. I am so excited to share all that we are going to do to our place with people that want the same things and have super ideas for us. My husband and I would like to find a way to leave the rat race to the rats. We are tired of debt, living paycheck to paycheck and praying that nothing dramatic happens. We are checking out options to downsize our lifestyle and go debt free. With four children we are exploring housing options. We'd like a better (more free) life for us and our kids. We'd like the option to grow some of our own food. I have been lurking for a while and enjoying y'all's projects. We are still 1.5 years out from our build but when we get to it I will let y'all know how it goes. My father build his own cabin before I was born. We had two homes. 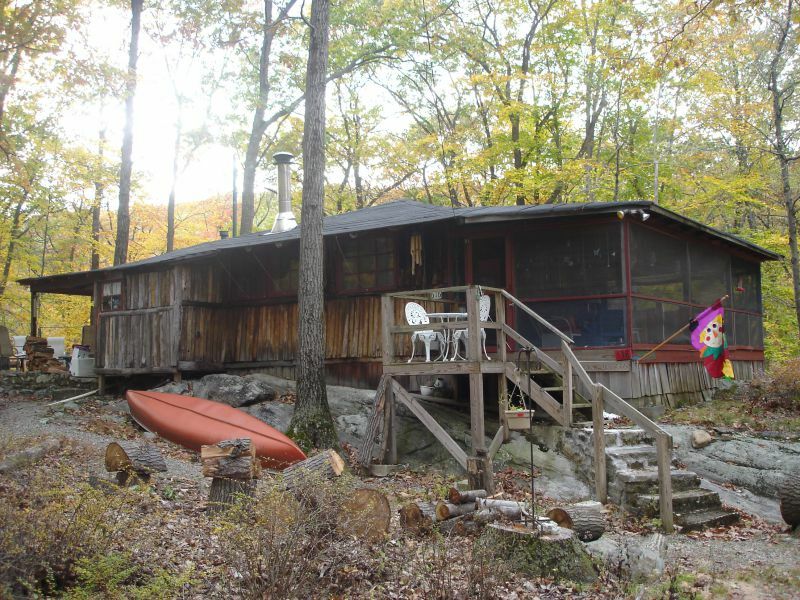 Growing up I had one home in a big city, and one totally off the grid home in the middle of the woods. I hated the city and loved the woods. As a little girl I would pack my bags for the day with my beloved books and a lunch, walk for what seemed like miles, and sit in the trees reading my books. We would spend the summers there when there was no school, weekends, and all long holidays. Most of my memories come from this place. My husband and I started dating as teenagers and we often took him along with us to the cabin. As the years went by my parents no longer wanted to be at the cabin, my mother was unbearable to be with, and my father didn't have the energy to go anymore. So, as soon as my husband and I could drive we went up there as often as possible. We also spent years there. He proposed to me there, and we eloped there one year later. We loved the cabin with all our hearts. Then my parents and I had a huge falling out and behind our backs they sold it. I have been heartbroken since and believe that the only people on Earth that know how I feel are all of you. Fast forward 10 years , we bought our own land last month and are putting up our own cabin in the spring to make the memories start again for us and our three boys. I came across this forum when I was searching info for compost toilets. And I thought...YAY! This is great! 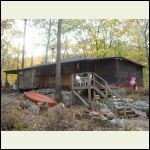 A forum with like minded people about living off the grid and building their own cabin. I hope to find good info here and would love to share the progress of building my cabin on my acreage. I start in Spring but lots to prepare during winter. College I take up rock climbing. Learn when you fall it hurts a lot. Learn not to fall. Graduate, go to work, work like a dog, get married to a country girl, have 2 girls. Do some camping but there were so many agendas. Keep working and dream of cabin. Oldest brother dies soon after early retirement. Me, still working like a dog. Re-evaluate priorities and make serious effort to act on dream. Buy land and cabin in woods. Still working like a dog but some of the labor is a love now. Why am I here. To learn about buildings a cabin. Right now my growing family live in a 2000 sq foot house on a postage stamp sized land and we are paying through the nose for it. We are tired of it. We are looking to downsize dramatically in house but increase our ability to do the things we want to. I came on this site to listen and learn from others that have been there, done that. So far I haven't been disappointed. Great people in here. Getting ready to build my piece next summer. Watching the progress of going from trees, to logs, to lumber, and next year, to a cabin. The planning of it all. Finding out what has worked for others and what has not. To keep tabs on my fellow pioneers. If I were living during the days when the wagons went west, I probably would have been on the first train out. 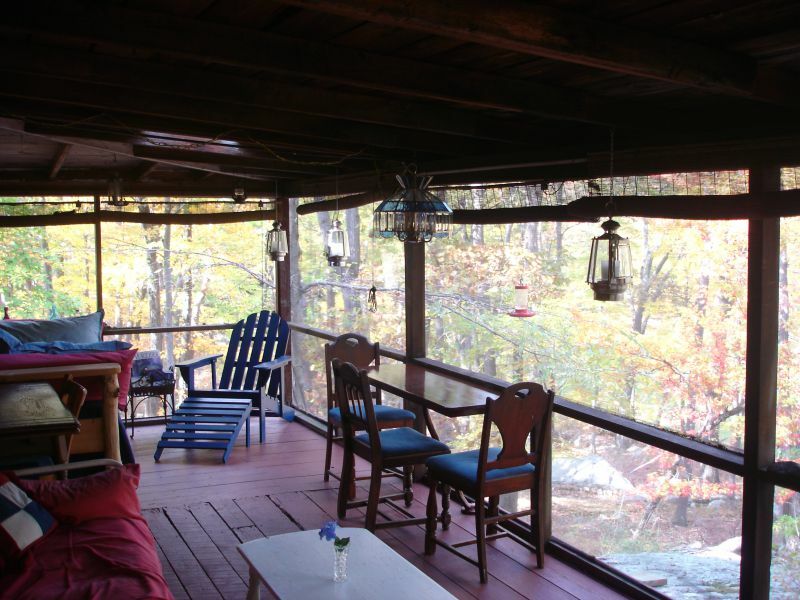 When I stay at my cabin, I can pretend for a few days that the "real" world does not exist. I'm very happy to be able to hangout in a digital community of like minded people. I also can echo the thoughts of many of the others on this thread. Found this site while looking for open air thrones and am thoroughly impressed with the sharing of ideas on how people have handled the multitude of issues that come with living off the beaten trail. As the old adage goes "none of us are as smart as all of us" Thanks to everyone! I've been obsessed the last 2 years or so trying to find an ideal 160 acre piece in BC, Canada to first build a small cabin, learn from it, and eventually build a larger earth sheltered home that I could retire too. Learning from others on the cabin side of the project is great, there are a lot of little things to think about. I'm really leaning towards a shipping container based project, something modular that I could build at my current home, then load up and ship it to my property and do final assembly and exterior work there. I like the containers for the speed of assembly on site, not so much for a save the earth sort of reason. I have a long history in working with dirt, I have been a landscaper since 1999, and switched over to excavating, crane trucks, and all sorts of machine related work in the last 5-8 years or so. Building things is what I do for fun and this will be the most challenging and rewarding project yet! The quick answer as to why I am here is because we purchased 25 acres in Muskoka Ontario this past fall. This is my first reply/ post so I will also introduce myself. Im 37 male, happily married for 17 years. We have an awesome 8 year old son. For work I manage very large land development/ civil construction projects . Mostly in the GTA/ southern Ontario. My interests/ obsession beyond family and work are hunting and fishing. The rest is the long answer. 1. I hope to teach my son how to build and give him the basic "fix-it" skills. My father is a builder. As much as I hated it when I was young, I gained a tonne of experience working for him throughout my school year's. Im also still close with him today. 2. Over the last couple of years my wife and I have come to realize that there is much more to life then corporate successes. We have realigned our priorities and made some significant lifestyle changes. Family first. What we create now will create memories similar to the ones my brothers and I have today. 3. We know this new venture wont be a walk in the park, but we do dream of how nice it will be to relax and read a book there someday. 4. With life being so busy, only so much time and money- a cottage is not for us. Today we think we will spend most of our time at the cabin in the fall (hunting season), a bit in the spring (no bugs and get rid of "cabin fever"), a weekend in the winter (to say we did it) and no time in the summer (kids sports, too hot, too many bugs and too many other fishing interests). 5. Over the years I have assembled a group of hunters. We are all good friends even though we may only get together a couple of weekends per year. Our focus is the big three, moose, bear and deer . We also go after migratory bird and small game. This property offers all of the habitats required. We are surrounded by 600 acres of crown land which abuts a lake. With a bit of effort we can access the south side of the lake and we are onto another 1000+ acres of crown. While doing our due diligence and walking the property there were no other hunters in the area. Its not getting any easier to attain permission to hunting land. So this is a gold mine from a hunting perspective. Ideally the cabin and bunkies will provide shelter, warmth and allot of laugh's for the gang! 6. My wife and I are not ready for everyday off the grid living (nor do i think we ever will be) but reducing our carbon foot print somewhat/ somewhere does seem intriguing. Due to my profession I have access to lots of salvaged building materials and old barns that are slated for demo. My intention is to reuse as much salvaged material as possible. I look forward to visiting this site often and gathering from your experiences. Hopefully soon I will be able to contribute and post some pictures of our venture. Hey, happy new year. I'm here because I am having a hard time deciding what to do. I'm a new member also. I just turned 64. I'm a carpenter by trade and enjoy time with my dogs and my lifted jeep. I live in central Ontario, Canada. In my present situation I will have to work until I die. But, I've found 25 acres on a small river. Access is by unopened road allowance only. So the only way out in the winter will be by snowmachine. If I were to purchase this property and sell my current home I could retire. I get my pension (small) in one year. I would build stack cordwood style. Being a carpenter, that's not the problem. The question I have is do I stay and work till death, or go off grid and enjoy the years I have left? I'm just looking for feedback from people who have left the rat race and was it worth it? I know it's a broad question, but your insites may help me choose my direction. I also live in ont. 67 just retired .I have recently had some medical issues . I would not want to be off road and carrying wood in my present condition . We all get frail sooner or later. I WOULD KEEP GOING AND PAYING C.P.P. AND TRY TO FIND A PLACE WITH ACCESS TO MEDICAL CARE FOR YOUR RETIREMENT YEARS . You can only do what is right for you. In our case DH and I can't live full time in our cabin. It's in Canada and we are US citizens. Winters are far to long for us. Life is hard in the winter up there and most of the people(relatives) I know that live near our cabin get cabin fever but can't leave. I don't want to live in a off grid cabin full time in the winter. We will never sell our home in the city. We have easy access to everything we need as we age. DH is already there he's 74 in great shape. Although he did have a health scare last year he is fine now.Being close to doctors that took our insurance made everything a little easier. I'm 52 and far to young to retire. The one thing that will keep me working is the cost of health care. There is no way I can afford to retire and get insured through Obamacare. I will be working until I am 62 and can qualify for Medicare and Social Security. I'm tired of working and miss my cabin everyday but I'm a realist. I know that anyplace no matter how nice can be a personal Hell if you are trying to survive with no money. Katoman, I too am a 64 year old carpenter. I've already posted here, but I am reading these last few posts. It's interesting. We all seem to think alike. I too have had episodes of deep thoughts of my weaknesses of my aging body. It has done me no good at all. I've been down for several years and trying to tidy things up before I check out. Ideas about where I should live, who will pay my bills, etc. It has made me weaker. What I need is to be stronger. I'm now at the point that I'm going to charge full speed ahead 'til the end. I'm going back to work as hard as I can. I might take a day off when I see something else to do. I may have to skip a day or more to let my back recover. I may need to have helpers to do things I use to do alone, But I shall not worry. Owen, thanks for that. I still love the work also. I'm just questioning it in myself that if I "retire" I can work because I CHOOSE to work, rather than I HAVE to work. Exactly. I am now building small cabins a lot, seven this year. I think I could make better money doing some other type of carpentry, but I like these people and I like my remote cabin. I also have a inside job to go to on those tough days. I have learned another skill, small engine repair. I work for someone else and punch a clock. It's a novelty, and I have to laugh every time they pay me for doing nothing, like today. Oh and those helpers that I need when building are almost all the time my adult children and even the oldest grandson. I get to teach them, and that is great for my self esteem. Not only teaching them skills, but life choices. Are you sure you want self employment? Or do you want the man to hand you money each week? They will decide with a example that I can provide. DH was self employed. Had a painting business for 38 years. He never worked for anyone else. That is why he is still working. I don't need to tell you how many sacrifices were made by the entire family(and are still being made) for him to remain self employed. I always worked for someone else. I had to do that because I remained employed while DH was home due to the holiday/winter slow down and many recessions over the years. Finally I had to do something before we lost everything. I found a job we could do together that required a limited amount of schooling with a immediate paycheck. OTR trucking fit the bill. It was not easy learning to drive a big rig in Feb in Green Bay but we did it! We are working for a large trucking company. We both agree this job(although stressful) has saved our lives in more ways than one. SWL -I know what you mean about winters too long. I grew up in Mass. and after college, the SS decided that they no longer wanted me (Vietnam winding down) so I married a Canadian and moved north. Never was crazy about winter but learned to tolerate it. I came to this site because I was looking for info on a composting toilet. I agree with most posts about the great community here with common values. I will be 65 this year and because I am self employed, plan to work a few more years. The health plan here is great for serious health issues, but minor ones take some perseverance. Never thought about that when I was younger either. This is a great site and maybe some day I''ll understand the watts and amps business of solar set ups. To be honest.....I totally forgot how I found this site. Probably googling small cabin designs and building info. Of course once I found the site, I was like "holy smokes" theres a TON of excellent information and innovative ideas here. I just recently purchased a small 3 acre plot in the mountains of Appalachia. And i'm looking to build myself a small, off-grid cabin. My ultimate goal is to have it built and it be a comfortable place to stay within the next few years. Once I reach that milestone, I plan on taking an early "semi-retirement". I say semi-retirement, because Im 34 and definitely do not have the 401k, Roth IRA, or stock portfolio to fully retire. But I would be happy flipping burgers if need be to pay taxes and have a decent truck. I wanted to get out to my place to fell some trees and get started building this week. Unfortunately work has pulled the plug on that plan. Just found the website. Wish I would have found it years ago. We bought land for our place in 2003. Built the shell in first year and spent the rest of the time finishing it. It's nearly to finished level, for us anyway. Still no well or septic, just have a outhouse. But for the time we are able to spend there, it might stay this way. I'm just starting out, looking into bunkies more than cabins but its all very interesting. I bought a 40 acre bush lot in the Huntsville Ontario, Canada area. I attend to be "off grid" and only using as a recreational property until I retire. You all have made a great website here, nice work to you all. Hello All! New member here, so I'll start by introducing myself. My name is Adam, I'm 35 and kind of a hermit. I live in a little town called Afton, in East TN (USA). As for the reason I'm here, Well, That's a good question. I don't know if I'm just looking for like minded people to bounce some ideas off of or what. I guess I have questions about other people's cabins and such, but I also just need to get some of my ideas out so they'll stop rattling around in my head all day. I'm gonna start a thread and ramble in it, so I don't clutter up this one. HMMM--The peace and solitude and at times being alone.I,m no hermit but do enjoy times at the cabin all by myself.No phone-TV-water-electric and no people.Ask yourself what,s the longest time you ever went without talking to or seeing another person?I enjoy going 5 or 6 days with no human interaction.Probably why I like to backpack alone.Now with my semi-remote(5 miles off pavement)cabin on a dead end road I have it and it,s nice to have my cabin to disappear to.I,m a big hunter and trapper but it,s mostly the peace and quiet.have a fantastic day!!!! 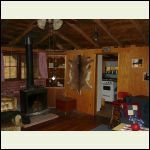 I found this forum while doing research on cabins in general. I was really happy to find a forum with so many people from all walks of life, and different places that all share the same passion. I have spent many hours reading and soaking up knowledge from all you good people. My wife and I have 60 acres here in mid western ALABAMA. One day while we were walking along a large creek on the back side of the property my wife made the comment that the place was so perfect that she could stay there forever. Over the years of our marriage I have learned to listen to even the minor statements this woman says and that started the ball rolling. We have picked the perfect spot, and hope to get things rolling soon. I will retire within the year, and while the cabin, around 600 sq.ft. May not be completed by then I hope to be close. We own two houses ( family property) about a mile from where the cabin will be, and will split time between them. 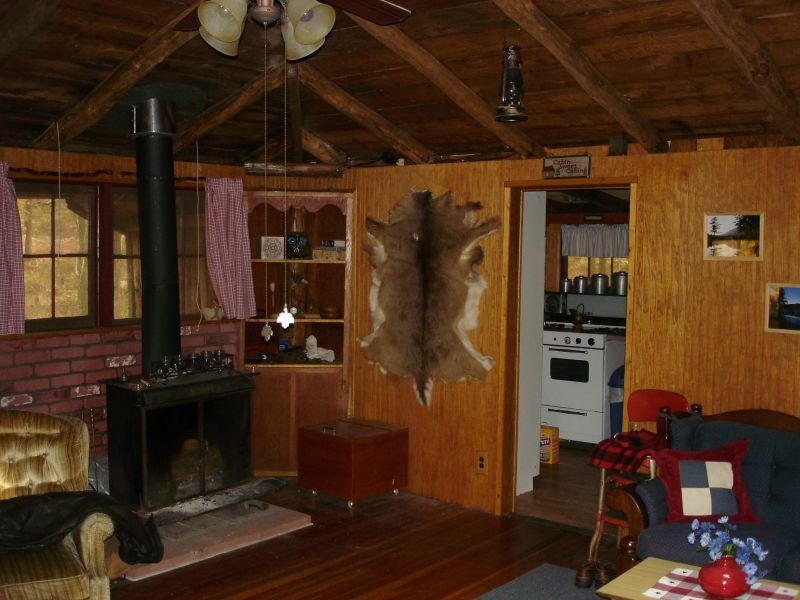 The cabin will be off the grid, with cistern, and a small garden spot. We have already set out a few fruit trees, and plain on more.